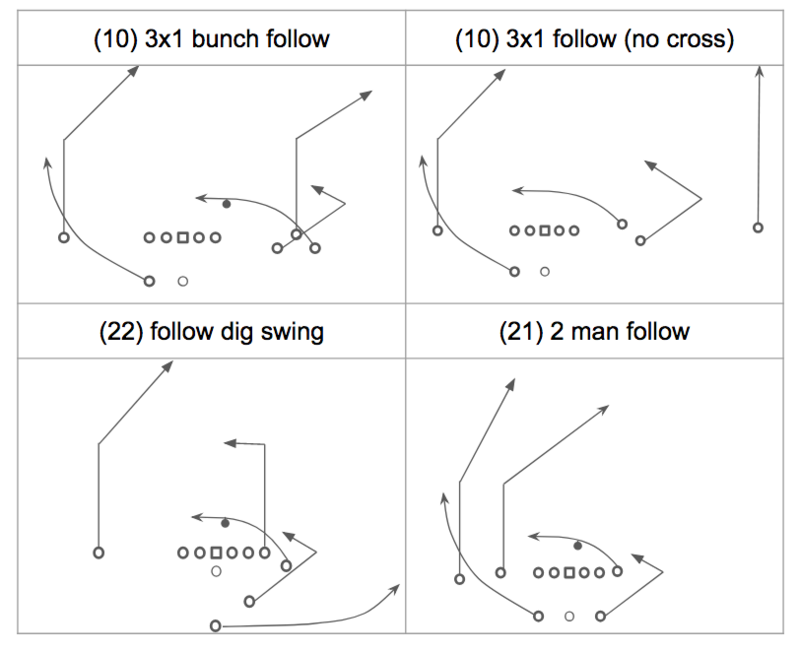 When doing a study on the efficiency of two-point play calls, one play that stood out as particularly efficient was the follow concept. When running the follow concept on two-point attempts, NFL teams converted 8 of 11 times (72.3 percent). When looking through my cut-ups of the play, I watched several teams with a variety of playing styles have great success with it. This article discusses several of the variations of the scheme. 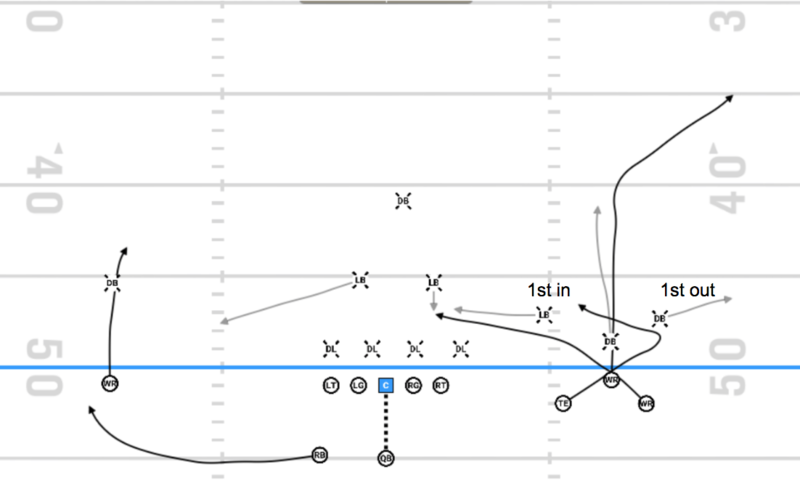 I call the follow concept any play where teams run a receiver on a shallow cross and “follow” it with an angle route. Most teams have their quarterback read the play from shallow to angle. Teams run this concept a variety of ways and from a variety of personnel groupings/formations. Below are just a couple of ways I’ve seen it run. As was stated in my two-point conversion study, the follow play is great against the banjo man coverages that teams often check when defending bunch formations. In the following example, out of a 10 personnel 3x1 bunch formation, Tulsa runs the scheme against banjo cover 1 and the angle route breaks open since the tight end that runs the follow route has leverage on the corner who is responsible for him. When teams try to play straight man coverage, the shallow cross is often open because the corner defending the shallow cross route has to get through a lot of traffic to make the play. Zone: When facing zone coverages, teams still like the follow concept against 2-high coverages, but against single high coverages, teams usually work a single high coverage beater to the front side of the formation, instead of working the follow concept. Against 2-high zone coverages, this play is designed to put stress on a linebacker. If the linebacker doesn’t take the shallow, the quarterback would throw the shallow. If the linebacker does run with it, the quarterback would throw the angle behind him. The three-man follow concept stresses the Mike backer while the 2-man follow concept stresses the outside backer. In this example, Kansas State runs 3-man shallow, and the Mike doesn’t cover the shallow, which opens it up for a big gain. 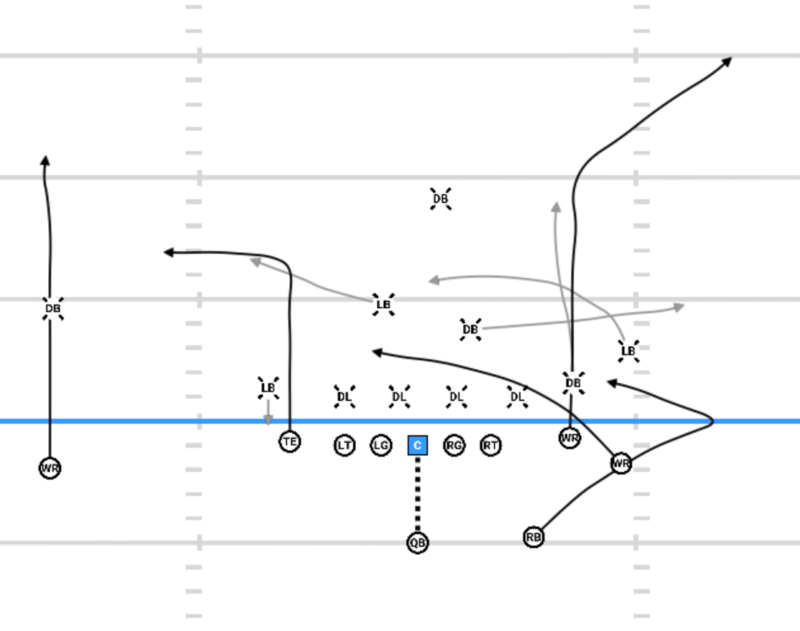 Unless you’re running a special variation of the follow concept such as the dig tag, the follow concept is not great against cover 3 due to the fact that the defense has 2 hook defenders to defend the shallow and angle routes. In this case teams often tag the play with a single high beater to the backside. Due to its flexibility, the follow concept can be utilized in any offense with great success. Most teams call it when they are expecting man/banjo man, however it has been an efficient concept against zone coverage as well.